The second in the RainBow Series project. Shot this image at Singapore’s famous Orchard Road. For all the fashion conscious folk, this street is Singapore’s retail Mecca. Lined with big brands such as Prada, Chanel, Louis Vuitton, Gucci and so many others, Orchard is always brimming with people, locals and tourists alike. As such you can always see people from different nationalities in this one square mile radius. Every photography enthusiasts delight! Street photography in Singapore does not get any more interesting than right here in Orchard Road. 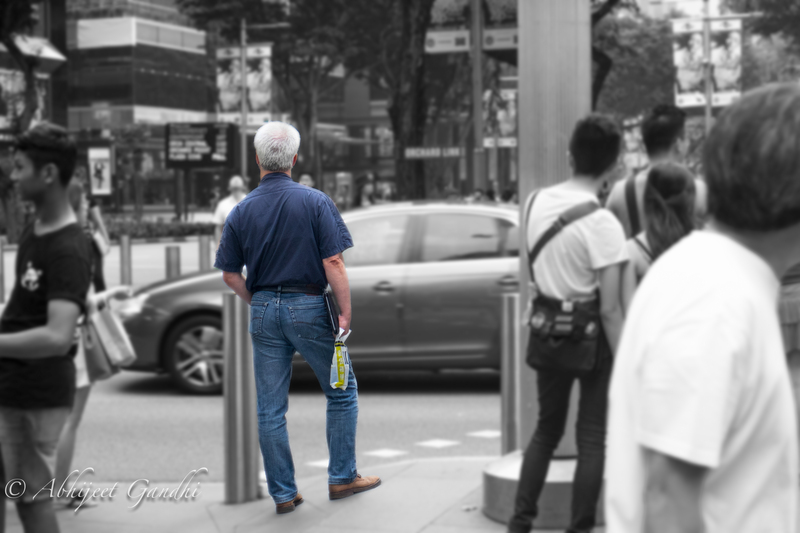 This particular gentleman was waiting patiently at the traffic light on Orchard Road. There was a charisma that he exuded that just caught my eye and persuaded me to take a picture. And of course the fact that he was dressed in all Blue made it an even more significant click.